Cake Fox: Super SWAG Dinkies Winter Fun Outfit Fatpack! Super SWAG Dinkies Winter Fun Outfit Fatpack! Super SWAG (at Cake Fox Swag location only) this weekend! 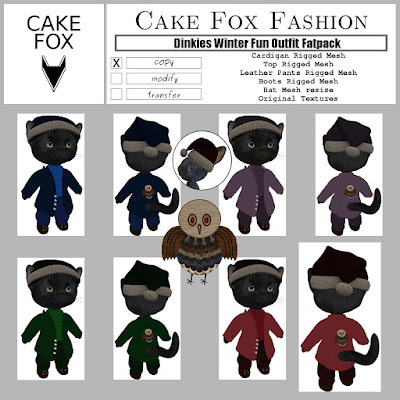 All four versions of the Cake Fox Dinkies Winter Fun Outfit in the same pack for just fifty lindens! Yes all colors! With an original owl art in the back of the cardigan. Works for cats and bunnies. Bunny hat is backwards.